Hans Christian Andersen is best known for his fairy tales, which were written for children, but on a deeper level grown-ups often find them rewarding. Some of his poems were also written particularly for children, and a few of them, set to music, have become standard works among Danish songs written for children, such as “Hist, hvor Vejen slaar en Bugt ”(“Mother and Child”) and “Pandebeen, Øiesteen” (“Nosey Tip, Rosy Lip”) both with melodies by J.C. Gebauer, and also, especially, “Danse, danse, Dukke min” (“Dance, Dance, Doll of Mine”), set to music by Fini Henriques. The text of this song can be enjoyed in two very different musical arrangements. On 17th September 1871 Andersen wrote the fairy tale “Sangen til Dukkerne” (“The Song for the Dolls”), in which a student sings the three verses of (“Dance, Dance, Doll of Mine”) to little Amalie and her dolls. This very short story was published for the first time in Illustreret Børneblad (Illustrated Children’s Paper) in November 1871, which was the first time the poem was printed in full. Until then the first verse had been printed in Folkekalender for Danmark (Folk Calendar for Denmark) July 1857 (without giving the author’s name). 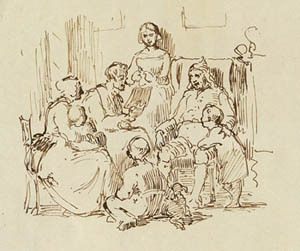 Andersen later described on several occasions how he had read the poem to groups of children, both in private homes and in a school. Fini Henriques published his collection of Børnesange (Songs for Children) op. 29 in 1907. It contains texts by several well-known Danish writers, including H.V. Kaalund, Poul Møller and Christian Richardt. Andersen however, is represented by only one poem, “Danse, danse, Dukke min” (“Dance, Dance, Doll of Mine”), which is also one of the few of these songs that is still known today. It is strophically composed [stanzaic? composed in stanzas?] and simple in form and therefore well-suited as a song for children and also as a community song. Leopold Rosenfeld published his melody for “Danse, danse, Dukke min” in 1904. His song on the other hand is a comprehensively composed romance, more for concert performance, but where even the accompaniment interprets the text, particularly when the dolls turn and spin round. The song was furthermore dedicated to the Finnish soprano Aino Ackté (1876–1944) who performed at the Royal Theatre in Copenhagen and especially during World War I mainly sang in the Scandinavian countries. Aino Ackté was widely acclaimed for her performances throughout Europe and also at the Metropolitan in New York during the first decades of the twentieth century. 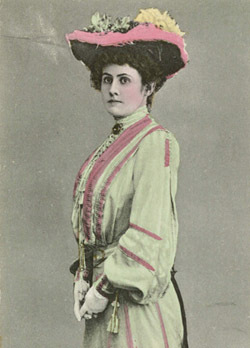 She sang predominantly dramatic parts such as the title role in Bizet’s Carmen, Senta in Wagner’s The Flying Dutchman, and Marguerite in Gounod’s Faust.